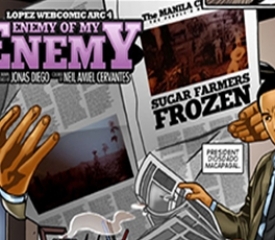 Enemy of My Enemy (Part 2) Page 7Tensions rise to a fever pitch as an all out-war breaks between business magnate Eugenio “Eñing” Lopez Sr. and President Ferdinand Marcos. Accusations get hurled, a resignation happens, and the two forces battle it out on mass media, giving way to headlines and news coverage from newspapers and radio and TV stations allied to an opposing side. 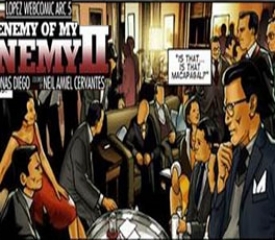 It's the truth versus propaganda in the latest installment of Enemy of My Enemy II—the spectacular retelling of the story behind the Martial Law era, as told in the Lopez perspective. Discover what happens when the two camps go on an all-out offensive against each other, culminating in the historic bombing of a liberal party meeting we all know as the Plaza Miranda Bombing incident. 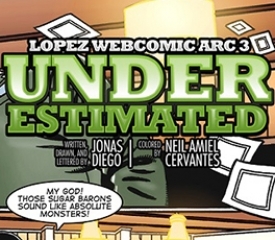 Click here to view the other pages of Enemy of My Enemy Part II. 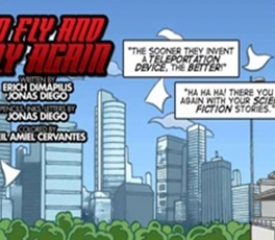 The Lopez webcomic series feature the watershed moments when Lopez Group founder Eugenio “Eñing” H. Lopez Sr. demonstrated the values that defined his character and paved the way for what is to become the Lopez Group today.